The Best Piano blogs from thousands of top Piano blogs in our index using search and social metrics. Data will be refreshed once a week. Also check out Piano Podcasts and Piano Videos from Best 30 Piano Youtube Channels. 2.3 Color In My Piano | Devoted to excellence in piano teaching. Piano newsletter is a comprehensive summary of the day's most important blog posts and news articles from the best Piano websites on the web, and delivered to your email inbox each morning. To subscribe, simply provide us with your email address. About Blog Want to know how to teach piano to kids? Discover the piano teaching tips, advice, and resources that are helping our piano teachers build successful studios. Facebook fans 16,482. Twitter followers 1,909. Melbourne, Victoria About Blog Listen to Tim Topham TV, the Piano Teaching Podcast for all the best new ideas for your studio. Facebook fans 5,426. Twitter followers 829. 3. Color In My Piano | Devoted to excellence in piano teaching. About Blog Piano Street by Op 111 Productions is a web based service for classical pianists, piano teachers, students and piano entusiasts. Our aim is to provide content and services of highest quality within the subject of classical piano playing and to faciliate and inspire communication between people from all over the world sharing the same interest or profession. Facebook fans 22,213. Twitter followers 4,961. About Blog A reddit feed for everything related to piano. Facebook fans 1,062,591. Twitter followers 455,830. About Blog Music, teaching material, reviews, and ideas for piano teachers. Facebook fans 4,044. Twitter followers n/a. About Blog Creative Piano TeachingComposeCreate.com provides piano teaching resources, piano teaching business solutions, and piano Music Kids Love. Piano teaching for the creative teacher. Facebook fans 4,504. Twitter followers 2,105. About Blog Find out how The Curious Piano Teachers can help you become more confident and professional in your day-to-day piano teaching. Facebook fans 3,732. Twitter followers 330. Berlin About Blog Join the world's first interactive online piano lessons. Play your first melody today! Facebook fans 2,924. Twitter followers 813. New York City About Blog Playground's mission is to give people the ability to learn how to play instruments conveniently, affordably, and efficiently. People use Playground Sessions to learn how to play their favorite songs while using its technology to seamlessly and simultaneously gain the skills to become avid musicians. Facebook fans 25,458. Twitter followers 8,747. About Blog Music blog by Grace Lam gives advice and inspiration to the everyday musician. Facebook fans 541. Twitter followers 1,025. About Blog Our website is all about digital pianos, how to choose, different reviews and so on. Facebook fans 16. Twitter followers 147. About Blog DoctorKeys' free piano videos for beginners, singers & songwriters. Learn to play by ear & accompany. About Blog It's not all black and white: motivational and creative ideas, favorite quotes, reviews about apps and tips on how to integrate them into your teaching. Facebook fans 1,997. Twitter followers 1,489. NAPLES, FLORIDA About Blog Euro Pianos Naples is a piano store with an exceptional selection of European pianos and designer pianos. We offer timeless quality of German and Italian pianos, as well as professional help of our consultants. Find out everything about pianos in our piano blog - the most popular and creative piano models, specific features, manufacturers, maintenance and etc. Facebook fans 627. Twitter followers 393. About Blog Pianodao informs and encourages piano players and teachers, and includes advice, articles, reviews, interviews and tuition content as well as qigong exercises. Facebook fans 1,012. Twitter followers 650. About Blog Clavier Companion is the premiere magazine for pianists, piano teachers, and piano enthusiasts. Facebook fans 4,052. Twitter followers 2,474. About Blog Learn to focus on the mind before the fingers and discover my Water Pianism philosophy. Facebook fans 956. Twitter followers 137. About Blog Learn piano the creative way at Colourful Keys piano studio in Kimmage, Dublin 12. Group and individual piano lessons that are fun, modern and relevant. Facebook fans 484. Twitter followers 122. About Blog This is the blog of Frances Wilson’s Piano Studio, and is intended as an exchange of information specifically for piano teachers, piano students and parents of piano students. Many of the posts are written specifically with my students in mind and cover aspects such as productive practising, resources for pianists and piano students, and reviews of teaching materials. Facebook fans 267. Twitter followers 4,461. On the Piano Bench About Blog Digital Piano Review Guide provides readers with honest, in-depth digital piano and keyboard reviews. Facebook fans 420. Twitter followers 9. About Blog Piano Teaching Tips and Tricks for Teachers, Parents and Students. About Blog Blog about life of a classical pianist. Share thoughts about music, competitions and education, learn ways to maintain emotional health. Poole Piano Studio Utah About Blog Cutting edge curriculum for Rapid paced results. Piano Mastermind... raising the Bar for teachers everywhere. Using Sight, Sound, Energy Efficiency and Mental Mastery in Piano Performance. Facebook fans 502. Twitter followers 23. About Blog The Piano-Yoga® is an internationally known method of learning the piano to the highest professional level through body awareness & promotion of wellbeing, created by pianist GéNIA. Facebook fans 400. Twitter followers 1,162. About Blog Performing Arts Education in Piano and Voice. About Blog Piano Lessons, Keyboard Harmony and Music Sheets. Facebook fans 1,112. Twitter followers 617. About Blog Teacher. Musician. Bookworm. Linguist. Biblicist. Facebook fans n/a. Twitter followers 239. About Blog A blog for Pianists and Musicians run by Musicians. Don't be a stranger, ask questions, submit posts and enjoy your stay at The Piano Blog. About Blog The Piano Guys! A miraculous meeting of 4 guys with the same purpose - to make a positive impact in the lives of people all over the world. Facebook fans 1,608,297. Twitter followers 127,511. About Blog Have you always wanted to learn to play the piano? The only proven online piano lessons program is now free! We offer free piano lessons for beginners, so get started today. Facebook fans 90,875. Twitter followers 779. About Blog Billboard #1 artist, Dr. Josh Wright's offers 5 series of piano lessons to help you master each area of your study. Facebook fans 5,065. Twitter followers 4,961. About Blog Piano Lesson Resources for Teachers and Students. Facebook fans 236. Twitter followers 80. About Blog Looking for the Best Digital Piano for 2017. Read Full Digital Piano Reviews Guide before buying a piano. Yamaha, Casio, Roland Piano are the leading brands. About Blog How to teach piano to kids. Practical teaching tips from experienced piano teacher, Diane Hidy, help young teachers get started and veterans stay motivated. Pedagogy advice, free resources and inspiration. About Blog Let's learn what playing the piano is all about. Facebook fans 135. Twitter followers 8. Miami, FL About Blog Welcome to you on my channel! Here you will find skill, laughter, wtf actions, gaming ... etc. On this channel you will find amazing chord progressions ideas to your personal purposes ! Facebook fans 36. Twitter followers 40. About Blog A glimpse into the private studio of Lori Bastien. About Blog Piano in a Flash features Emmy Award Winning Instructor Scott Houston. Scott's innovative teaching method lets you learn by playing your favorite songs. Facebook fans 2,814. Twitter followers 503. About Blog OnlinePianist is the only animated piano tutorial which allows its users to fully customize their learning experience. It offers a wide array of unique features giving users the ability to run tutorials in their own time, at their own pace, either on the go or in the comfort of their homes. Facebook fans 64,525. Twitter followers 1,833. About Blog JoyTunes makes it easy and fun for anyone to learn piano! Learn piano with our piano apps that automatically detect notes played on real instruments providing you with instant feedback. With thousands of songs to learn with, you'll be inspired to play and keep practicing. Facebook fans 26,126. Twitter followers 2,695. 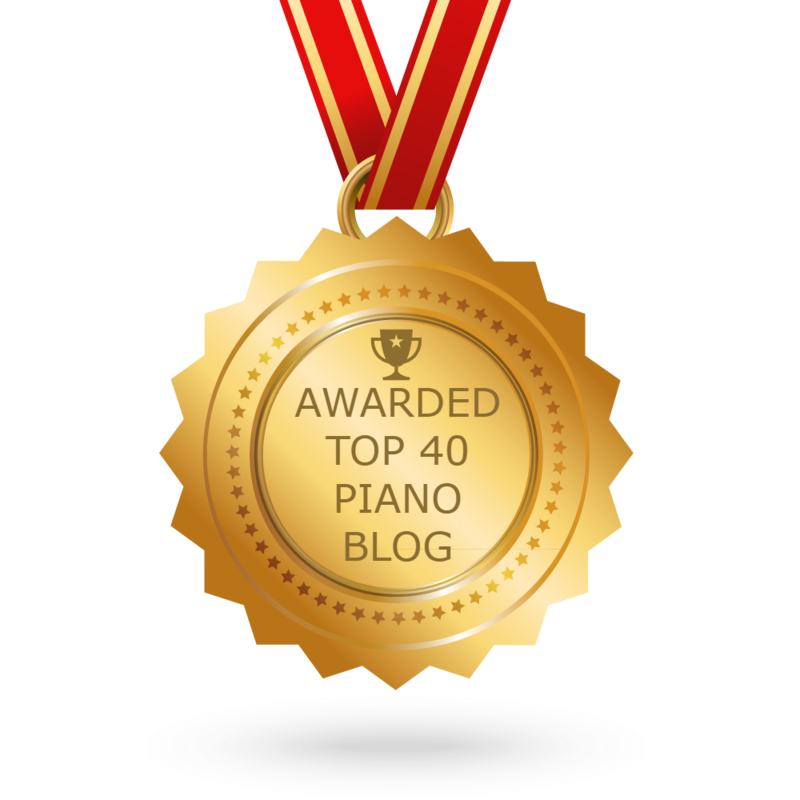 CONGRATULATIONS to every blogger that has made this Top Piano Blogs list! This is the most comprehensive list of best Piano blogs on the internet and I’m honoured to have you as part of this! I personally give you a high-five and want to thank you for your contribution to this world.